MANGO KEITT (Mangifera indica L.). This tree is moderately vigorous, with long, hanging branches; it is adorned with very fragrant flowers and is considered by experts to produce the best of the late-season mangoes. 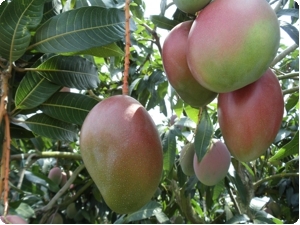 The Keitt mango fruit is oval shaped and predominantly yellow-green in colour with a pale pink veneer; containing a juicy pulp without fibre, it is the largest of the Florida mangoes, ranging from 200 grams in weight to more than 1.2 kilograms. Because it boasts less colour and less fragrance than Hayden, Kent or the Tommy Atkins varieties, this mango is often overlooked, generally because it is perceived as unripe when actually it is perfectly mature. The mango grows in different soils from very fertile to those sparse in nutrients, provided the soil is deep, permeable, well drained and slightly acidic with a pH between 5.0 and 6.8 and a water table below 2.5 metres. 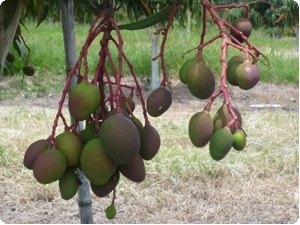 The mango is suited to an area bordering the tropics, from 23 ° 27 'N to 23 ° 27' south, with respect to the Equator. In the tropics mango is cultivated from around sea level up to an altitude of 1700m and in the subtropics at sea level. In Colombia, the mango is grown at altitudes greater than 1200 metres but with reduced production and of a lower quality. For commercial cultivation of mango to succeed it should be grown below 600 metres, with a defined dry season of 3 months or so, in order to promote an abundant and healthy bloom prior to the initial development of the fruit, this helps prevent fungus attacks on the flowers and fruits (Goguey, 1993). The lack of rainfall during the flowering period is the most important factor for successful mango cultivation. The optimum temperature for growth and healthy production is between 24 and 27 ° C (ProFrutal, 1994). The average annual rainfall should be around 750mm; humidity allows growth of the trees with little or no irrigation. Weather conditions, particularly the temperature determine the time of flowering and fruit ripening. 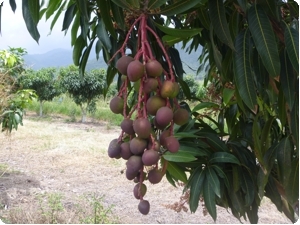 According to Galvis and Herrera (1995), mango cultivation in relatively low humidity is preferred. Ambient humidity greater than 70% interferes with pollination and affects the health of the fruit. According to the same source, a high amount of sunlight promotes flowering, fruiting, development and fruit colour. Scattering the trees at a distance no closer than 10 metres between them enables an appropriate distribution of sunlight, trees should be planted mainly in light soils. Strong winds cause flowers, fruits and branches to fall (Goguey, 1993). The output of the mango crop faces constraints from several sources which limit commercialisation, especially for exportation, among which: diseases such as anthracnose and powdery mildew; the presence of fruit flies, thrips, mites and ants; the alternation of production; excessive tree size which restricts phytosanitary activities and impedes harvesting and the concentration of the harvest between June and August that fosters an oversupply causing a lower value of the product. There are many varieties that differ from one growing area to the next: the size, the colour of the skin and the pulp, the variety of flavour, the aroma of the fruit and other such features. Given its content of natural antioxidants, the mango is a fruit of great interest nutritionally. A mango of 300 grams is sufficient for all the vitamin C and vitamin A an adult requires and is an excellent source of beta carotene in addition to its adequate fibre content.